Hakkasan Mayfair is a relatively new location (opened in 2010) of the Hakkasan family of restaurants globally, and yet has won Michelin stars in 2012 and in 2013. Hakkasan (Mayfair) is perhaps very famous for its Peking Duck, New Zealand / Australian Lobster etc. which can burn a hole in your pocket. 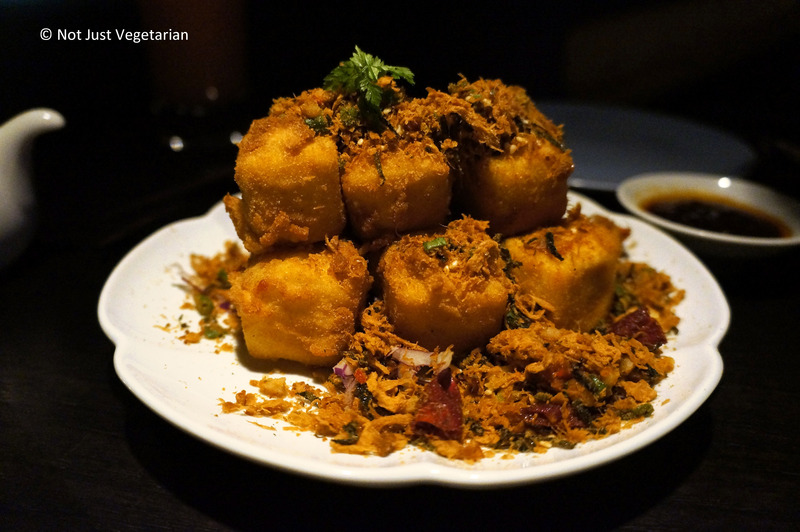 This review is based on a relatively simple (and mostly vegetarian) late night dining experience on the ground floor of Hakkasan Mayfair. The interior of Hakkasan Mayfair is consistent with their decor in sister restaurants in NYC (review to be posted on Not Just Vegetarian at some point in the future), and in Miami – both of which Not Just Vegetarian has been to. Dark wood, low lighting, lounge music, good service, unique cocktails, and some great food (available late night) are other consistencies. Chef Tong Chee Hwee’s brings a modern flair to Cantonese dishes. 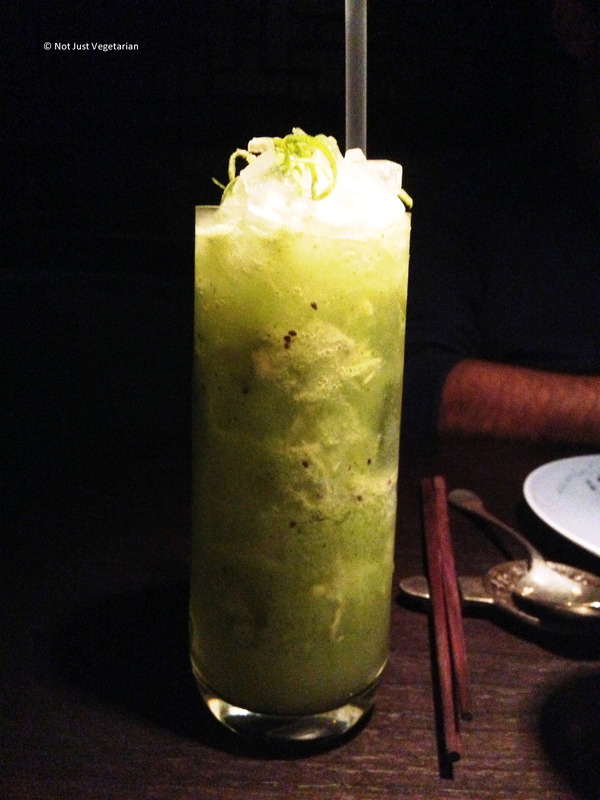 Washing potatoes is a strange name for a cocktail made from kiwi fruit, ginger, coriander, lychee and apple juice. I loved this cocktail for being sweet, spicy, and yet very balanced. So, what then again, is the connection between potatoes and this cocktail? We started with a plate of vegetarian dim sum. 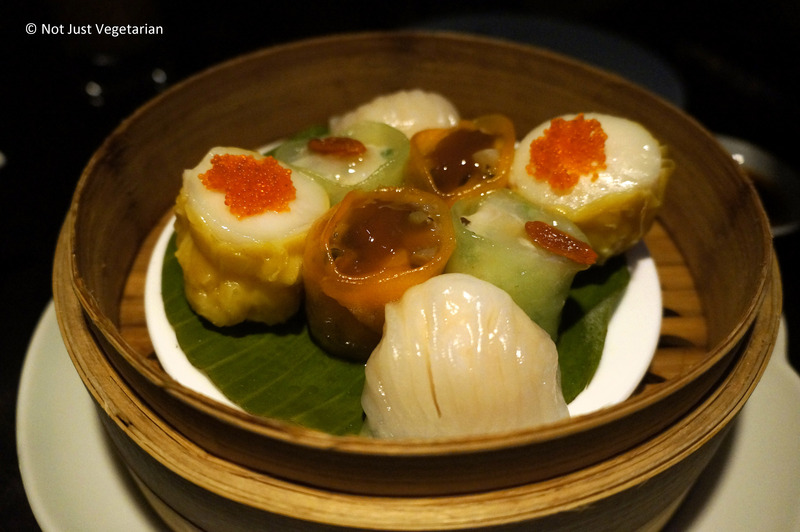 Dim sums in Hakkasan are quite famous and this dish certainly did not let us down! Salt and pepper tofu is a common dish in many Chinese / Asian restaurants. The dish at Hakkasan Mayfair is in that it includes Pumpkin Tofu. The current online menu does not list this, but it is well worth ordering if it’s still being served (unlikely with the new Christmas menu). The tofu was savoury with a hint of sweetness and the pumpkin in the tofu was subtle yet distinct enough to not miss. The tofu was topped with gratings of what felt like crispy (dehydrated?) pumpkin. Wish this dish was served year round. 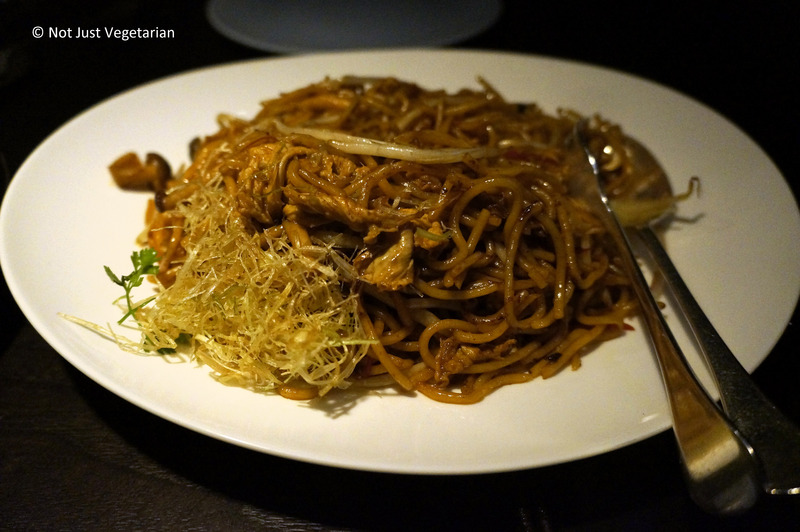 Hakka noodles with mushrooms (with Chinese chives in other Hakkasan locations) is an all time favorite of mine. The stir fried chicken with spring onions and red chilies was excellent. The chicken is well cooked (not dry) and well-balanced (combination of savoury flavour of the soy sauce, spiciness from the red chilies, and mild sweetness). I would get this again if it’s offered on the menu. The dish that is closest to this on the current Hakkasan menu is the French bean and minced chicken in spicy bean sauce. 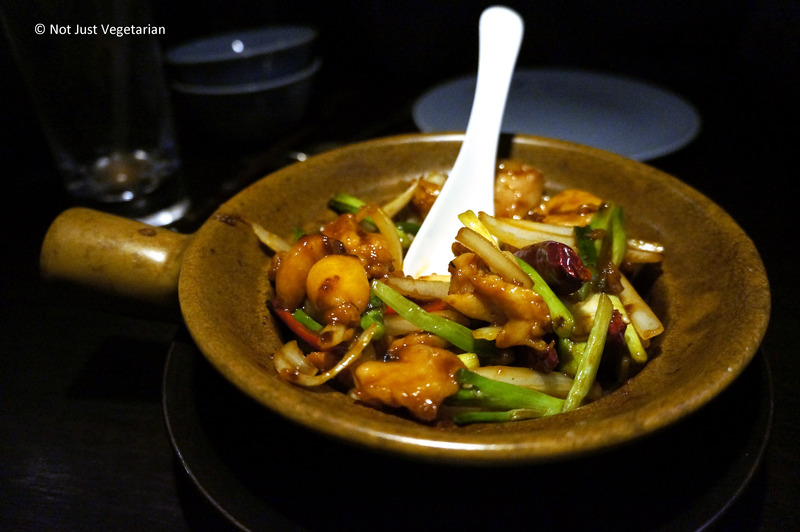 I go to Hakkasan for its consistency in serving modern Cantonese dishes (available late night) in a very nice club / lounge setting. There are many vegetarian options (labeled appropriately) that we have not tried yet and would love to go back to Hakkasan to try those.